At BlizzCon 2018’s Opening Ceremony, principal game designer Wyatt Cheng concluded the panel by revealing Diablo Immortal, a brand new mobile game in the action RPG franchise. It will feature online cooperative play and a demo is playable at BlizzCon in Hall D.
The game will tell stories from the 20 years of Diablo history between the events of Diablo 2, when Tyrael shattered the Worldstone, and the beginning of Diablo 3. It will include what happened to humanity after Tyrael sacrificed himself, what Deckard Cain was up to, why Malthael abandoned Heaven, how the demon hunters were founded, and what the golden age of Westmarch was like. Blizzard collaborated with longstanding partner NetEase to create the game. The game will be controlled with “intuitive actions, gestures and touch controls.” Immortal will be playable exclusively on Android, iPhone, and iPad. During the ceremony, Blizzard showed off gameplay footage featuring the barbarian, wizard, sorcerer, monk, crusader, and necromancer. They showed some interesting new environments, including combat on a raft moving across water and hanging from a rope in a deep, dark pit. New spells and abilities were also featured, including demon hunters swinging from the ceiling by a chain. 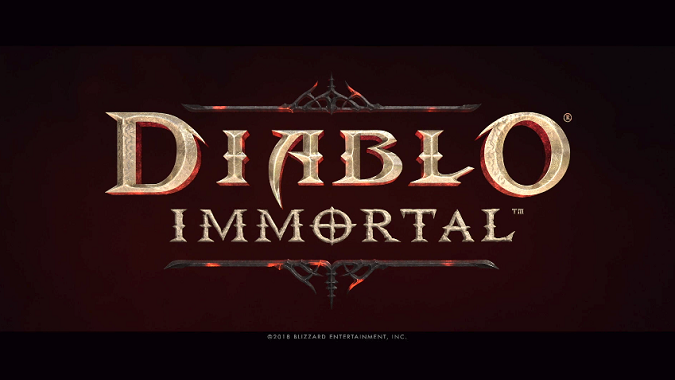 While the announcement is a disappointment to many who were hoping for Diablo 4 or a Diablo MMO, at first glance the game looks like a worthy addition to the Diablo franchise — and at second glance, we’re pretty excited about it. We walked away from an interview and a hands-on demo really looking forward to Diablo Immortal.